Our first hike of the trip was to Kjerag Bolten on a misty day. We made a neste pakke (what our guides taught us to call our sack lunches on the trip) in the foggy parking lot and got going. Getting an early start was important as this is a popular spot, even on a day with poor visibility. This hike involves three big hills will valleys in between, so the elevation gain comes in bursts. The steep sections (both up and down) have chains that you can hold on to, and we definitely needed them. The rock we were hiking on had good grip but it was steep. The benefit of this was getting a good arm workout in during the hike. And of course, safety! Once we reached the top we mostly had the place to ourselves, which was nice. One of our guides demonstrated get on and off of the Kjeragbolten (photo below). 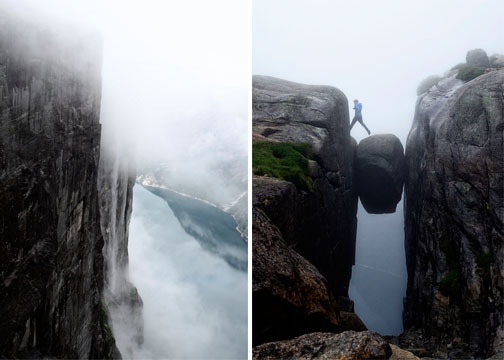 When you're standing on the boulder it is a 984 meter drop to the fjord below. My fear of heights kept me far from the edges of the cliff and far from the boulder, but it was fun watching my braver hiking partners take the risk. Even with the fog, it was a beautiful hike. We caught glimpses of the Lysefjord below us to remind us there was actually an end to the vapory abyss. When we got back to the parking lot our guides pulled beers out of the van, mama sheep toured their babies around looking for handouts, and a man was playing an alpine horn out into the valley around us. Norway, you crazy, amazing place!